Under manager Ned Yost, the Kansas City Royals have ranked last in intentional walks allowed for the past two seasons. Here, Yost celebrates after winning the 2015 ALCS. How would a baseball fan from the 1980s, awoken from “Futurama”-style suspended animation, be able to tell that teams evaluate data differently in 2016 than they did 30 years earlier? Once our unfrozen fan figured out what a website is and how it works, the best tipoff might be the number of teams whose front-office pages include job titles like “quantitative analyst” or “decision scientist,” or the number of times per public statement that baseball executives say “process.” Maybe it would be on-base-percentage standout Shin-Soo Choo’s salary, which is tied for the sixth-highest among outfielders under contract for 2016 despite his pedestrian single-season highs of 22 homers, 22 steals and 90 RBIs. Or maybe the clincher would be the report that roughly 20 teams checked in with the Atlanta Braves about the asking price for starter Shelby Miller (including the Arizona Diamondbacks, who eventually landed him) despite Miller’s 6-17 win-loss record last season. But what’s missing from most games might be just as instructive as what’s become more common. Among the most conspicuous canary corpses lining the sabermetric coal mine are pitchouts, intentional walks and sacrifice bunts — three tactics in use since the 19th century that have seen their reputations suffer in the age of sabermetrics. None of them has gone extinct, but all are endangered, with each reaching its lowest recorded level last season. All three tactics force teams to accept something bad in order to increase their odds of getting something good. When managers decide to pitch out, they sacrifice the possibility of a strike for a better chance of nabbing a base stealer. 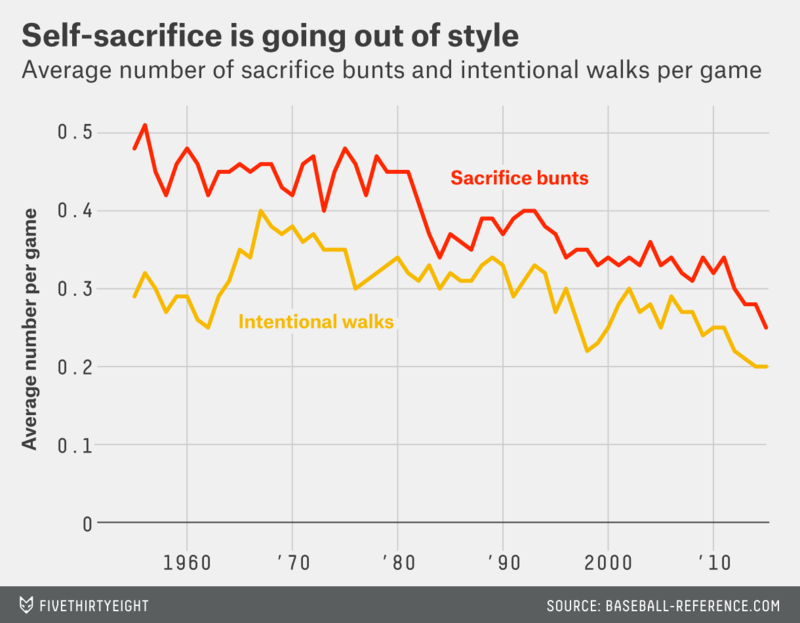 When they signal for a sacrifice bunt, they give up an out to raise the probability of scoring a run on a single (or an additional sacrifice out). And when they order an intentional walk, they concede a baserunner to set up a matchup with a weaker batter who they believe is more likely to let them escape from the inning unscathed. In recent years, those costs and benefits have been better quantified, and research has suggested that the moves have long been abused. Baker backed up the conclusion of Baseball Prospectus writer Sam Miller, who showed in 2013 that pitchouts are probably counterproductive. The problem is that managers guess right relatively rarely. According to MLBAM’s, only 19 percent of pitchouts from 2011 to 2015 coincided with steal attempts. That means that for every pitchout that did so, more than four resulted in a ball while the runner stayed glued to the bag. About 36 percent of those pitches would have been balls anyway — the league-wide strike rate over that span was 64 percent — but that still means that pitchouts turned strikes into balls more often than they gave catchers a better chance of stopping a steal. And now that we know how much worse hitters perform after falling behind in the count, we also know that losing even a single strike comes at a significant cost. 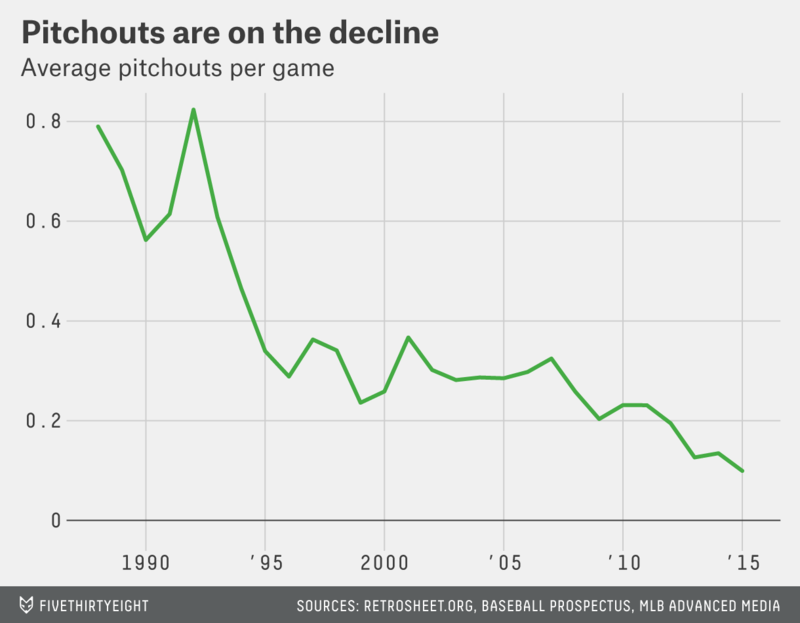 It’s likely that the decline in pitchouts is tied at least loosely to a corresponding decline in stolen-base attempts — which in turn is tied to a growing awareness of the cost of being caught stealing, another way in which managers have curbed their excesses. But even in a high-steal environment, a pitchout-heavy stratagem would be tough to justify. For the pitchout to make sense, managers would have to guess right almost 50 percent of the time, especially given that the tactic doesn’t act as a deterrent to future steals. And more and more managers are conceding that they can’t pull off the impossible. MLBAM’s records claim that the 2015 Boston Red Sox were the first team to play a full season without a single pitchout. Red Sox manager John Farrell disputed that stat, saying that the Sox threw three, according to the team’s internal numbers. But he acknowledged that Boston downplays the pitchout, although the coaching staff’s philosophy wasn’t dictated by a front-office study. “We try to put it in the hands of the pitcher and the catcher,” Farrell said. “So, varying our hold times, making sure that we school guys enough to have unloading times where they’re controlling the running game and minimizing that without artificially doing it through a pitchout.” In 2015, Cincinnati Reds manager Bryan Price and then-Seattle Mariners manager Lloyd McClendon pitched out 30 and 28 times, respectively, making them by far the most anachronistic skippers in their respective leagues. While the falling number of pitchouts might seem predictable in a low-steal era, other tactics have fallen out of favor in an environment where, at first glance, they’d seem positioned to thrive. Sac bunts and free passes have fallen despite a league-wide decrease in scoring — which tends to make sacrifices and intentional walks less costly — and pitchers’ deepening offensive ineptitude, which gives them greater incentive to bunt and makes the batters hitting ahead of them more likely to be IBB’d. Run-expectancy tables based on records from hundreds of thousands of rallies and routine innings have revealed that in many cases, sacrifice bunts impair a team’s offensive outlook, while intentional walks improve an opponent’s. “I think that’s probably where some of the sabermetrician starts to come into play,” Farrell said. World Series-winning manager Ned Yost, whose old-school reputation has persisted despite his sabermetric bookshelf and extremely laissez-faire style, is at the forefront of the anti-IBB trend. The Kansas City Royals have ranked last in IBBs allowed for the past two seasons, thanks to Yost’s appreciation for the percentages. On the other side of the ball, “sac bunting is bad” had been a sabermetric maxim for decades before “Moneyball” made it mainstream. Even now, Oakland’s bunt total brings up the rear, but more clubs are keeping the A’s company. Neuropsychologically speaking, it’s easy to see why a manager would be tempted to try to prevent a steal, push across a run or bypass a scary batter. But baseball’s ever-tighter embrace of advanced stats is making managers smarter — more likely to take the long view and less likely to go by their gut. Thanks to Ezra Wise and Cory Schwartz of MLB Advanced Media, Rob McQuown of Baseball Prospectus, and Hans Van Slooten of Baseball-Reference.com for research assistance. According to totals tracked by Baseball Info Solutions. Based on 1988-98 Retrosheet.org data provided by Baseball Prospectus and 1999-2015 data provided by MLB Advanced Media.